Don't let everyday aches and pains slow you down. 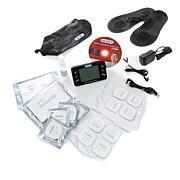 DR-HO'S Circulation Promoter is powered by the DR-HO'S Pain Therapy System and combines TENS and EMS therapy to temporarily increase local blood circulation in healthy muscles to help temporarily relieve pain in the feet and legs. You can also use the included body pads help temporarily relieve pain in the back of the neck, upper and lower back or with pain associated with arthritis. Plus, it's compact and portable, so you can use it at home or on the go. - Patients who have a cardiac pacemaker, implanted defibrillator, or other implanted metallic or electronic device. Such use could cause electric shock, burns, electrical interference, or death. You may experience skin irritation and burns beneath the stimulation electrodes applied to the skin. You may experience headache and other painful sensations during or following the application of electrical stimulation near your eyes and to your head and face. You should stop using the device and should consult with their physicians if they experience adverse reactions from the device. Do not use to treat one region for extended periods of time (i.e., do not exceed more than 40 minutes per session, up to 3 times/day) or muscles in that region may become exhausted and sore. Please consult your doctor prior to use. Use and Care: Main Unit and Foot Base - Use wet cloth or neutral cleanser to wipe machine. Keep away from moisture, high temperature, direct sunlight or sprinkling water. Do not dismantle or repair. 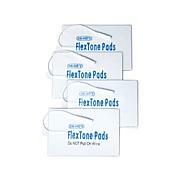 Electrode Body Pads - Never stick two electrode pads together. Keep clean and never put under high temperature. 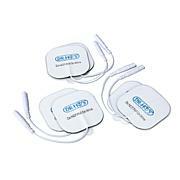 Gently clean electrode pads with water rubbed over the pad with your finger. Do not clean with hot water or any chemical. Would Highly recommend this product, it really works and has helped w/ the nerve pain I have been suffereing with for 3 and 1/2 years. This really works! I am really excited about this... I have fibromyalgia and RA and was getting numb in my left foot. At first the left foot could not feel very much. After using it for weeks the feeling came back. My last visit to Doc, I told him I do not need the muscle relaxer any longer. I'm down to 2 pills a day and feel so good I'm thinking about going to Disneyland. Before using this machine, I was certain I never would again! Hello Disneyland, here I come! Thx Dr Ho!! I love this product, it is very helpful, but the right side does not work as well as the left. Tried on my husband and he said the same thing. Is there anything I can do about this. My shoulder was better right away. I have numbness in toes on the left foot and issues with my right calf as well. Every time I use this I feel different, and more, nerve endings pulse, and it seems that the increased blood flow is 'waking up' some places that haven't had much feeling. I will keep using it and hope it gets even better. I love to be active so I will try anything within reason, and this is a winner so far. My Last Resort & It worked! Out of no where I had the worse ache in the muscle above my hip and was trying everything.I just happened to turn on HSN and Dr. Ho and Colleen were presenting the product and I got interested.I trust Colleen and when she said she uses it regularly I ordered it right away. I have used it now for about 3 days and am finding such relief I figure by the end of the week I will have won the battle and can go on maintenance!Give it a try!